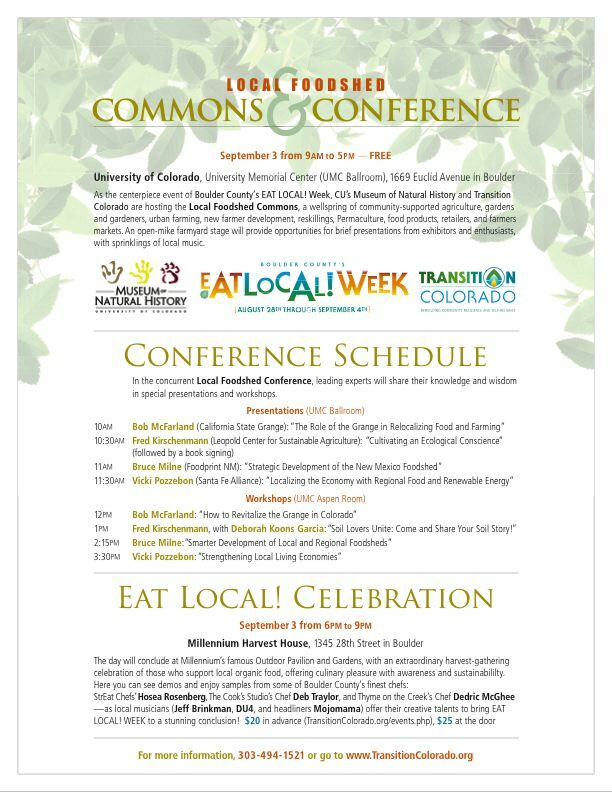 Solar Gardens Institute will have a booth and speaker at the Transititon Colorado Local Foodshed Commons and Conference this coming Friday, September 3. The event will take place from 9AM to 5PM at the University Memorial Center Ballroom at 1669 Euclid Avenue in Boulder. 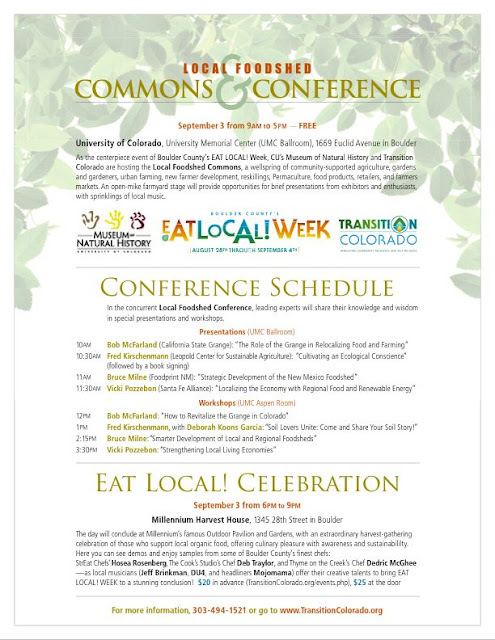 All are invited to celebrate the connection between community supported agriculture and community supported energy. Community owned solar energy in the U.S. had its start in Ellensburg, Washington. Gary Nystedt at the local municipal utility used grant money and community funds to build a 26 kilowatt array, with the panels leased to utility customers. The Ellensburg Solar Community, conceived in 2003 and completed in 2006, is now in its third phase, having grown to 78 kilowatts. The Sacramento Municipal Utilities District (SMUD) installed a community solar array in 2007 called SMUD Solar Shares. This is now the nation’s largest solar garden, at a Megawatt in size. Subscribers enter into a power purchase agreement with the utility. Few are aware of the scale of the existing solar gardens movement. This year we’ve already seen four announcements of a “first” (starting with us!) – all are important steps forward, but may understate prior work. The first identified use of the term “solar garden” was first used to describe utility scale facilities, and was used in Spain as well as the United States. “Community Solar Garden” was apparently first used by Luke Hinkle of My Generation Energy in Massachusetts. Various community wind programs around the country often preceded community solar. The first community solar facility in Colorado was built by United Power Solpartners in Brighton in 2008 – 48 people each purchased the energy from a single panel. Solar Panel Hosting started our 10 kilowatt prototype facility in Westminster in March 2010. The idea of community ownership of renewable energy is nothing new in Europe, of course. In Denmark and Germany it’s common for people to own shares in a wind turbine or solar array. States and localities in the United States are beginning to offer tools such as a feed-in tariff (FIT), third party ownership, and virtual net metering. Community solar organizers around the country have used a wide variety of models to deal with securities regulations while passing tax credits to the consumer. Leases and power purchase agreements are most commonly used, as they avoid the need for securities registration entirely, and are relatively simple. Until the SUN Act is passed, the investors in or owners of the solar garden must claim the federal 30% tax credit to the savings on to the subscribers – not always easy to do. In other cases, subscribers form an organization such as a limited liability corporation, a co-op, or a nonprofit. Each has its advantages and disadvantages in terms of tax structure, the ability to pass through profits, and variability from state to state. Schemes exist to capture tax credits through an LLC structure while avoiding securities regulation, but have yet to be fully tested by regulators or the courts. Different structures better serve different segments of the market – individual ownership might be good for those with the cash or credit to pay up front, while low and middle income folks might find a lease the best option. At the Solar Panel Hosting Company ( http://www.solarpanelhosting.com ), we are committed to customer choice and community participation, finding the right organizational structure and financial model for your solar garden. Our business models are designed to limit up front costs for both hosts and subscribers, and leverage the human energy embedded in each community. We want to be sure subscribers from all income levels have a chance to participate. Look forward to our upcoming announcement of specific pricing. I'll be giving a presentation on Community Solar Gardens this September at the Solar Fiesta in Albuquerque. The workshop will be on Saturday the 11th at 2:15 PM (see schedule). Solar professionals and all interested attendees are welcome. The Colorado Public Utilities commission is undertaking a rule-making process for the Community Solar Gardens Act. These rules will set a precedent - nothing like this has been implemented on such a large scale ever before. It is truly a ground-breaking moment! The new rules must be ready by October 1 ... not too much longer now. How will projects be chosen to fit under the total program size? What requirements will be made of subscriber organizations? What preference will be given to solar gardens that include farmers or low income people? Public input can have an impact, and anyone may comment. The Colorado Public Utilities Commission is developing rules for HR1342, the Community Solar Gardens Act. If you are interested in being part of this discussion, email info@solargardens.org and we will bring your concerns forward as part the Solar Gardens Institute PUC filing. 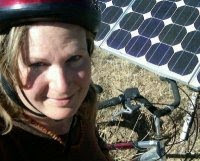 Solar Gardens Act author Claire Levy tells me that XCEL or Black Hills will select those solar gardens over 500 kilowatts that go under competitive bidding. The smaller gardens will go under a standard offer from the utility - XCEL is developing theirs this month. The PUC will decide how the solar gardens under the standard offer are allocated, given the program's limited size. Given the wide interest in solar gardens, it's certain there will be far more applications than the 6 Megawatt cap for the first three years. In order for the program to make a serious dent in Colorado's carbon consumption, we are going to have to ramp this up by a factor of ten to 60 megawatts a year! This would allow 1 in 20 by 2020 to become solar garden subscribers (with an equal number getting solar on their own roofs). A plan like this would require a shift in public and private investment away from fossil fuels and solar megaprojects and towards distributed energy.